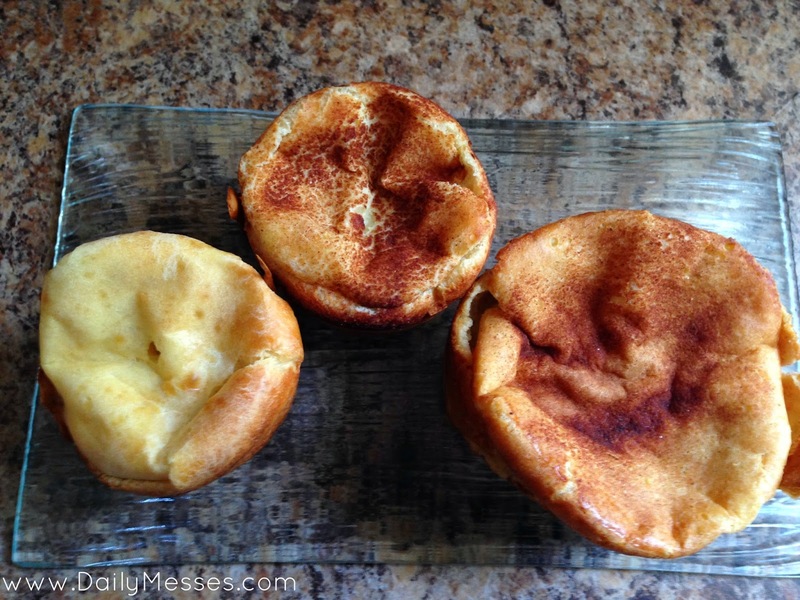 Here is another new recipe we tried...Popovers! The boys loved them at dinner instead of a roll, at breakfast, and as a quick snack. We made some plain and others had cinnamon/sugar sprinkled on top. Surprisingly, the plain ones were the biggest hit with the boys while I liked the cinnamon/sugar ones best. 2. Lightly beat eggs. Combine all ingredients and mix well until smooth, but be careful not to over mix. Cover. Set aside for 30 minutes. 3. Spoon about 1/2 teaspoon oil into each muffin pan/ramekin and swirl around to coat. Place pan in oven for 2-3 minutes to heat oil. You don't want it to smoke or burn though. 4. Optional: Sprinkle cinnamon/sugar mix on top of batter. 5. Fill pans about halfway and bake for 20 minutes, or until golden brown and puffy. These are pretty easy to adjust to your tastes. You could add vanilla extract, or herbs or Parmesan cheese to the batter for a more savory popover. I have better results if the milk and eggs are at room temperature. I also used a large muffin pan, which seemed to work well. If you don't have yogurt, you can adjust the recipe (3 eggs, 1 1/3 cup flour, 1 1/3 cup milk, 1/2 teaspoon salt). Mix together. Oil and preheat pan for 2-3 minutes. Fill pan halfway. Bake at 450 degrees F for 15 minutes. Reduce temp to 350 degrees F and bake for 15-20 minutes, or until puffy and golden brown.